I hate everything about that headline. The Cleveland Browns need a veteran quarterback, one who can hold down the fort while whichever rookie they draft is given time to develop. However, two prime candidates were effectively taken off the board in the span of 24 hours. As a result, the team’s options have gotten limited. Which is why one of my biggest fears is getting closer to coming true. 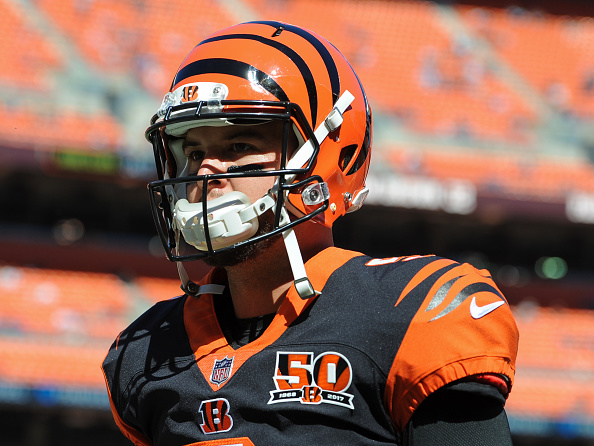 Hue Jackson is likely going to get the quarterback he’s wanted for a long time now – AJ McCarron. Yes, the same quarterback who can’t beat out Andy Dalton for the Cincinnati Bengals starting job. The same quarterback who Cleveland inexplicably and aggressively pursued at last season’s trade deadline, when the team was one fax machine blunder away from giving the Bengals two draft picks for a glorified backup. The same quarterback who, weeks after the failed trade attempt, Jackson ran across the field to embrace as if he was hugging his son. That guy is likely coming to Cleveland, and there’s very little to like about it. Sure, Browns fans dreamt of trading for Alex Smith, or signing Kirk Cousins provided the Washington Redskins let him hit the free agency market. However, both scenarios were eliminated yesterday. Hours after the Cousins claimed he would prioritize winning over money when picking his next franchise, his current team traded for Smith. Though this means Cousins will indeed hit the market, his desire to join a successful team won’t be fulfilled in Cleveland. There will still be options available for the Browns. However, don’t be shocked if Jackson is already hammering home his desire to go after McCarron. This, of course, gives me a great deal of concern. For many reasons. Secondly, and most obviously, what about McCarron is so appealing? His stats are mediocre, as he’s only started a handful of games with the Bengals. Sure, he has a few wins under his belt, but hardly enough to see him as a vast improvement from what the Browns currently have. Top it off with the fact the team already has what appears to be a McCarron clone in Cody Kessler, and you can see why the pursuit of Cincy’s backup remains as perplexing as ever. However, my biggest fear is having what I’d see as a worst-case scenario coming true on a team which always seems to find those kinds of outcomes. Let’s say Jackson gets his wish and the Browns end up acquiring McCarron. What happens if he ends up putting more effort in making it work with a career backup than he does in developing whoever Cleveland drafts? Hell, what if Jackson attempts to convince the front office there’s no need to select a QB in the first round now that he has his franchise guy? Sure, that sounds idiotic on paper (to normal people). At the same time, consider who we’re talking about here. Jackson is the one who claimed he “felt the earth move” when watching Robert Griffin III workout back in 2016. He single-handedly ruined any chance of DeShone Kizer becoming an effective quarterback due to his unwillingness to work with him. He also still very clearly believes not one bit of his 1-31 record is his fault. Do you really think someone like this would be above hitching his wagon to a severely underwhelming McCarron, stubbornly refusing to accept orders to work with anyone else? If you’ve followed Jackson’s time in Cleveland, you know the answer is an overwhelming no. He already showed us he was more than willing to quit on Kizer had the failed McCarron trade actually gone through. This is all hypothetical at this point. We still don’t even know if McCarron will win his grievance against the Bengals and become an unrestricted free agent. That said, having to pony up assets for his services didn’t appear to be an issue for the Browns back in November. Still, the disaster we’ve witnessed since Jackson arrived has forced me to accept Murphy’s Law situations as far more likely to occur than this team doing something right. As a result, it sure feels like Cleveland’s coach is going to get the quarterback he’s inexplicably coveted for quite some time. As you can see, there’s certainly a lot to be worried about if this comes true.